A new year is an appropriate time to consider new approaches. 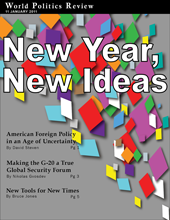 So to begin 2011, World Politics Review invited David Steven, Nikolas Gvosdev and Bruce Jones to come up with new ideas for U.S. diplomacy and global governance. Whether it comes to implementing the ambitious vision of the QDDR, addressing global security issues or adapting global governance institutions to emerging challenges, fresh thinking will be the key to finding effective solutions. In diplomacy, the cult of the gifted amateur took hold early and has never lost its grip: no matter that governments are failing to manage the world's most-pressing problems, as long as our man in Buenos Aires, Beijing or Brussels can write as entertainingly as a junior scribe at the Economist. Fortunately, the Obama administration has proved less easy to please. Accepting the Nobel Peace Prize in 2009, President Barack Obama expressed his concern that the existing global "architecture is buckling under the weight of new threats." Part of the problem is that there is no truly representative coordinating committee for the world's leading powers to consult on security matters. But there is no need to invent a new gathering. Instead, the G-20 could provide the basis for a true Global Security Forum. The Obama administration's National Security Strategy asserted that, "As influence extends to more countries and capitals, we will build new and deeper partnerships in every region, and strengthen international standards and institutions." Two years in, the administration has made good headway on the first part of that goal. The challenge now is to pick up the second part of the sentence.